Trust the experts at Subaru of Lethbridge to keep your vehicle in top condition. 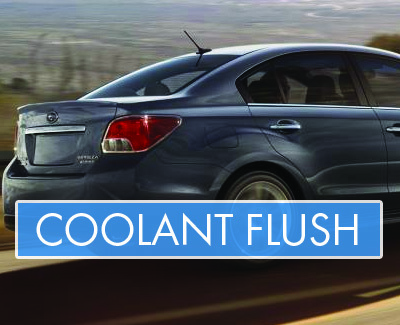 Get a coolant flush for your Subaru, Chevrolet, Honda or Nissan, as we cover ALL makes and models. Keep your vehicle cool and fresh in the summer to avoid the overheating and stressing your engine. Q: WHEN SHOULD I CHANGE MY ENGINE COOLANT? A: Your vehicle's coolant antifreeze needs to be replaced every 5 years or every 240,000 km, depending on which comes first. Q: WHAT IS THE FUNCTION OF ENGINE COOLANT IN MY VEHICLE? A: Engine coolant will provide your vehicle with corrosion protection to your engine components, freeze protection from sub zero temperatures, boil protection, heat transfer to the passenger compartment of vehicles, lubrication to the water pump and general chemical and oxidative stability to ensure efficient functioning of the cooling system.